Jim Dolan is live in New Jersey with the latest details. 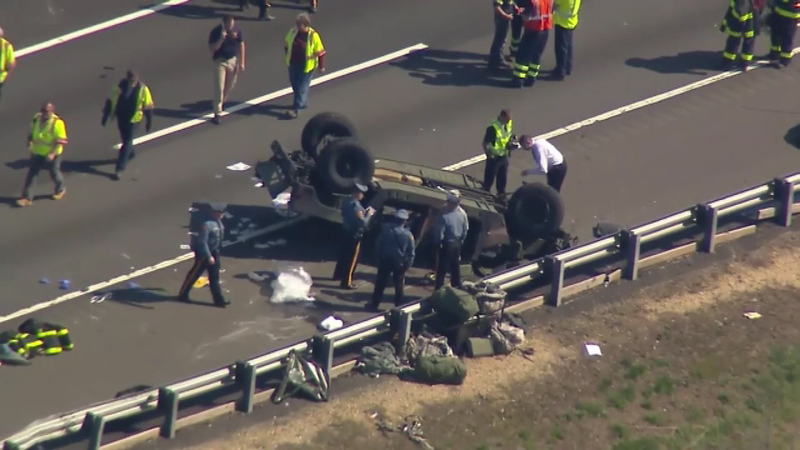 SOUTH BRUNSWICK, New Jersey (WABC) -- Authorities have released the identities of four Army Reserve soldiers who were seriously injured Thursday when their Humvee overturned on the New Jersey Turnpike in South Brunswick, and one witness who stopped to help is recalling the harrowing details. The Humvee was part of a two-vehicle caravan headed southbound when the driver lost control and hit the guardrail just after 2:30 p.m. and overturned. The most seriously injured was 25-year-old Deborah Perez, from Brooklyn, who was airlifted to Robert Wood Johnson Hospital and needed to have her leg amputated. She is now listed in serious condition. "I saw the soldier that was hurt the most, the young lady," witness Mike Watsey said. "And it's not something you can un-see." Watsey said he had nightmares when he finally could fall asleep Thursday night after he was one of the first to stop and offer aid. "I broke down, I got upset, just seeing them there," he said. Also seriously hurt were 35-year-old Marcos Santana, of Poughkeepsie, and 40-year-old Theodore Jackson, of Lincoln Park. The driver, 29-year-old Gedry Concepcion-Munez, of the Bronx, suffered the least serious injuries. Jackson remains in critical condition, while Santana is listed in serious condition and Concepcion-Munez in good condition. 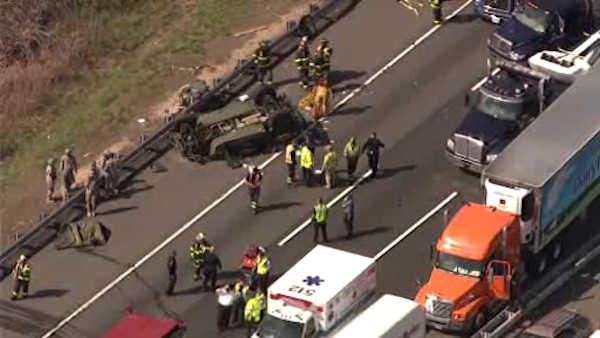 Four soldiers were injured Thursday when their Humvee overturned on the New Jersey Turnpike in South Brunswick. The cause of the crash is still under investigation, but it is believed the vehicle lost a tire. "I was able to see the wheel leaning against the guardrail, and you could see part of the control arm," Watsey said. "I mean, it just broke off." The other vehicle in the caravan was not involved in the crash, and the servicemen in that vehicle pulled over to help, along with good Samaritans like Watsey. "I ended up grabbing my jack," he said. "I was attempting to help them jack up the vehicle. We got it up enough that the one soldier was actually able to breathe and move...Three of the four soldiers that were traveling with the vehicle were trapped. They could not get out. They were yelling, and everyone was trying to calm them down. The accident created a traffic nightmare for commuters, but real nightmares for those who stopped to help. "It was very tough to see," he said. "I had a very rough night last night trying to sleep." It is not immediately known where the soldiers were going, but there is a major base, Joint Base McGuire-Fort Dix in Lakehurst, south of the crash. The Army Reservists were from the 533rd Brigade Support Battalion at Fort Totten in Bayside, Queens.